March 2014 - There is now a Russian translation thanks to Sambusik. 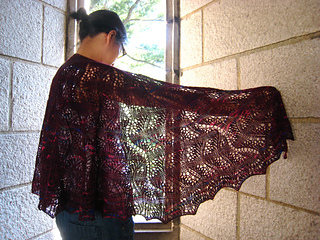 This shawl is crescent shaped, with a scalloped edge. 3 ends of 2/28nm silk from Colourmart at 2300 yards per 150gram cone was used in the originals. The full sized, green one weighs 125 grams which would be about 650 yards for an equivalent 4 ply yarn. It measures 60 cm from nape of neck to lower edge, with a wingspan of 135cm. 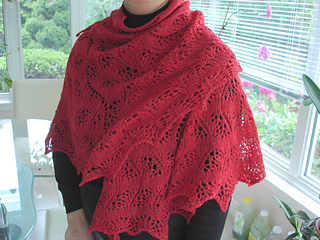 The pink one in the photo was knitted on 3.75mm needles, and ends at row 113 with a sideways knitted 3 stitch cast off. 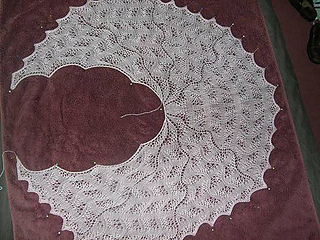 Note that a revised pdf was posted on 7th September 2008 that includes a different edging & the first 15 rows written as well as charted to help less experienced knitters. A further revision has been posted 28th February 2011 to swap the ssk & k2tog in the written instructions. Row 21 onwards, be aware that there is a YO at the beginning of each wedge, as per the chart, not just at the edges, It is easily missed!